A detailed scientific and technological analysis of Da Vinci's earliest-known drawing has revealed a hidden, previously unseen sketch, as well as a special skill. In addition to being an inventor, painter, sculptor, mathematician, engineer, amateur botanist, cartographer, and all-round polymath, Leonardo Da Vinci was also ambidextrous, new research into a work of his commissioned by Italy's Uffizi Gallery has shown. Carrying out an infrared light analysis of the Arno Valley, a landscape drawing for Santa Maria della Neve created in 1473, when Da Vinci was 21 years old, researchers from the Florence-based Opificio delle Pietre Dure heritage institution found traces of a secret, separate and previously hidden landscape, along with text, on its reverse side. The work features the artist's vision of the Arno River Valley and the Motelupo Castle outside Florence, with words going from right to left on the front, as well as a script on the reverse from left to right thought to allude to an informal contract of some kind. A detailed study of the texts show they were both written by Da Vinci, indicating that he was capable of writing with equal proficiency using both his left and right hands. "It is a real revolution in the field of Leonardo studies," Eike Schmidt, director of the Uffizi Gallery, said, according to the Corriere Della Sera newspaper. "The elements that emerged during this research open up new perspectives on the interpretation of Leonardo's [painting] and on how the artist (built) the landscape, on his technique and even on his habits and abilities in writing," Schmidt added. Da Vinci's handedness has been the subject of considerable debate among art historians and other academics, with the popular conception of him being left-handed challenged by visual analyses of his art. Opificio delle Pietre Dure's study appears to put an end to that debate by conclusively showing that he was ambidextrous. 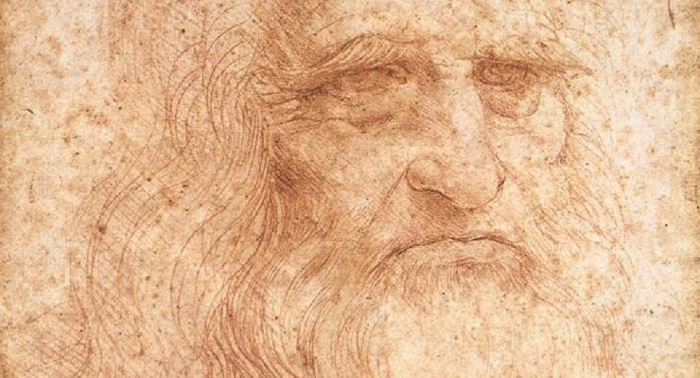 "Leonardo was born left-handed, but was taught to write with his right hand from a very young age," art historian Cecilia Frosinini explained. "By looking at his writings, including from this drawing, one can see his right-handed calligraphy is educated and well done," she noted. The findings come less than a month ahead of the 500th anniversary of Da Vinci's death, to be commemorated on 2 May, with museums across Italy, Europe and the world dedicating numerous exhibitions to celebrate his many achievements.